Your gateway for ethical, non-conflict diamonds, Fair Trade diamonds & other conflict free diamonds. Enjoy your excursion in the domain of environmentally friendly diamonds! An essential element of the Diamonds.Org mission is the dissimination of information on the topics of non conflict diamond (conflict free diamonds), fair trade diamonds (fairtrade diamonds) and sites and brands and FOR them. To that extent we offer our visitors and supporters our FORUM and BLOG. Diamonds.org is your gateway to a wealth of information and sites dedicated to the issue of non conflict diamonds (aka nonconflict diamonds): conflict free diamonds that are mined and traded in an ethical manner, without sponsoring any military conflict (as "blood diamonds" do), and with respect to the environment and the miners (environmentally friendly). As such, some qualify to be regarded as Fair Trade Diamonds (or, Fairtrade Diamonds). 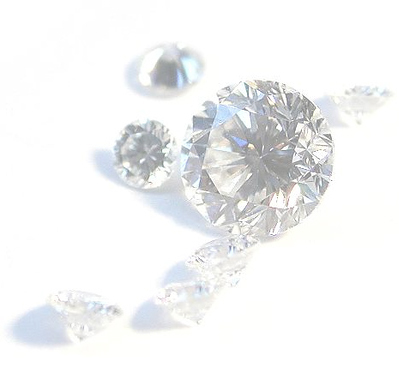 We consider laboratory grown diamonds as environmentally harmless diamonds. Most diamonds in conformity with the Kimberley Process, or originating from documented artisanal diamond mining, as well as all Canadian diamonds qualify as conflict free diamonds (again, aka non-conflict diamonds or ethical diamonds).